The second version of the Alphacool Repack Dual Bayres 5,25" is now available! Based on the development of the Alphacool Repack Dual 5.25 Bay Station, this Bay reservoir also brings its advantages to the table: Easy mounting, compact dimensions and appealing design! All of these features and many more are implemented in the Alphacool Repack Single Bayres. But Alphacool would not be Alphacool, if this new product would not also have some extremely interesting new features, which were not available until now! The Alphacool Repack Dual Bayres 5,25" - Rev.2 is designed for installation in the front of an enclosure. Two vacant 5.25” drive bays are needed. By default, the connection of in- and Outlet can be achieved via ¼” threaded openings. Additionally Alphacool offers the possibility to use 3/8” threads for reduced flow resistance. Of course all four openings can also be used parallel, e.g. to allow installation of a second cooling loop. Unlike most reservoirs, where the coolant is sent around multiple corners, still leaving micro-bubbles in the coolant, this reservoir utilizes a new technology: Both In- and Outlet openings are equipped with a special filter which eliminates even the smallest bubbles in the coolant! Filling has always been a hassle with standard slot-in reservoirs: Unscrew, pull out, fill, push in and tighten screws again. Enough of this! The front of this reservoir has a filling straw which can be taken out by unscrewing it. As it is hollow, it can now be used for filling of the reservoir. We recommend using a filling bottle or funnel from our portfolio. 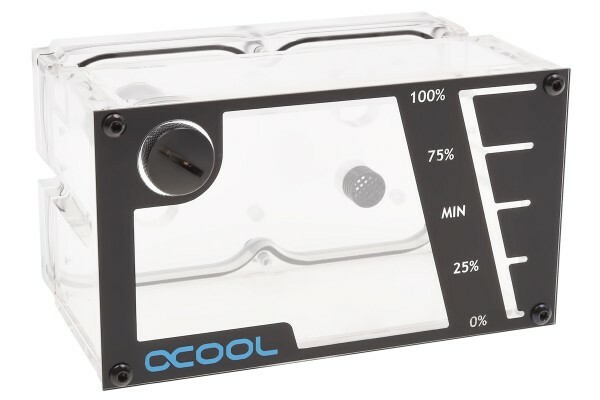 The front of the reservoir, the component which mainly remains visible after installation, is just beautiful to look at: Plexi, Acetal and a fill level indicator in combination with the typical Alphacool copper create a truly elegant design. Lighting is the next step towards a perfect system: At the rear of the reservoir, up to six 5mm LEDs can be inserted. Highlight: From the top a 10cm long cold light cathode can be inserted! This is the ultimate lighting source four your reservoir. In combination with the LEDs it is even possible to have different colors inside of the reservoir. Especially with a Heatmaster as a controller, the possibilities are endless! More power, better looks, easy handling and high quality: This is truly a First-class reservoir for your system! Due to the large number of different enclosures, complications may arise when inserting the Dual reservoir. The dimensions of the reservoir were made to fit flush in the front of the enclosure, meaning that internal modifications to the enclosure may be needed for installation. Die Möglichkeit besteht, allerdings übernimmt Alphacool dann die Gewährleistung nicht. Optisch sehr ansprechend wenn man LED´s einbaut, passt pefekt in den 5,25" Doppelschacht und verrichtet treu und vorallem dicht seinen Dienst! ;) Durch den Einfüllstutzen war die Befüllung sehr einfach.